Today is Friday, April 8, 2011. Japan was hit with another earthquake this week. Portugal joined Greece and Ireland for a ECB bailout rendering them a ward of the EU state. The US Congress has yet to agree on a budget for the fiscal year as they haggle over spending cuts. The Republican plan is to leave the citizens with $15,800,000,000,000 dollars of debt in another year and the Democrat plan is to leave the citizens with $15,900,000,000,000 dollars of debt in another year. The current WHO (White House Occupant) has proposed a budget with a deficit of $1.6 trillion. Added to the current debt of $14.3 trillion, I extrapolate the debt in another year to be $15.9 trillion. So, our ‘representatives’ are arguing over whether or not to cut a paltry $100 billion from the proposed budget. Let’s be honest. Does it really matter any more? Again, if I must, I will offer my services to find a solution to a balanced budget. In return, I expect to be compensated like the CEO of a big bank. What follows is the simple solution. First, we must realize that the Federal Reserve is an organization of incompetence run by dunderheads! Before readers jump to a conclusion about my assessment, let’s review the evidence. The Fed has been trying frantically to make sure to pillage the US Treasury and redistribute the wealth of the United States into the pockets of the big bank CEOs. Uh - I mean, they have been trying frantically to resuscitate the US economy with a policy of artificially low interest rates. They have done so in part by implementing the so-called QE2 program under which the Fed has become the largest purchaser of US debt in the world. Fed Chairman Bernanke announced the strategy on September 1, 2010. Soon after, the Fed began systematically buying US Treasury notes and mortgage backed security paper. In all, their plan was to buy $900 billion dollars worth by June, 2011. They of course, carry this action out with our money procreated by our Treasury! Let’s get back to my premise of the incompetence and the dunderheaded behavior. Witness the chart below to see that the 10-year US Treasury bond price (the green line) has declined by about 10% so far (since QE2 implementation). The Fed has in essence, taken our money and lost 10% in about seven months. I don’t even want to speculate how much they have lost on the mortgage paper. But so far, let’s stick with the Treasuries and as evidenced by the chart, we have lost about $90 billion dollars on the strategy. Is the word ‘incompetent’ beginning to ring true? Well, I guess the word ‘dunderhead’ could also be applied as we look at the other line on the chart. That black/red line is the price of silver over this same time span. It has doubled. Why didn’t Bernanke order the Treasury to print up a trillion bucks and just buy silver? QE2 has been the catalyst driving silver to today’s price of over $40 dollars per ounce. If Ben had bought silver instead of Treasuries with our trillion, we would now be up a trillion instead of down $90 billion. Nice going, Ben! Don’t you wish you had that guy for your personal financial advisor? Ha! Even worse, what if he were in charge of the whole country? Oh yeah - he is. No wonder we are in such terrible shape. Is the Fed really this stupid? Give the chart a good look and then read on for my budget balancing solution. Okay. So we need about $14 trillion in a hurry least we join Portugal in complete surrender. We have a secret weapon. We have Ben Bernanke. If silver doubles every six months for every trillion we print, why don’t we have Ben run off another $2 and buy silver? In a year and a half, our $2 trillion would grow to $16 trillion. We could pay off the debt and have $2 trillion left over for a party. We could invite the Chinese and Japanese over to smooth things over for destroying the currency of all those US bonds they bought from us. But hey - somebody has to be sacrificed! The budget can be balanced. We just need to use silver instead of Federal Reserve Notes or US Treasuries. In case readers have not clued in on my sarcasm, there is an important point here for investors. Ben Bernanke has been silver’s best friend. QE2 comes to an end in June and the RSI (bottom of the chart) is showing the price of silver to be much extended at this point. Should the Fed withdraw their economic IV, investors should not expect silver to continue higher. On the other hand, should the Fed recognize that they ARE the economy and then resort to another dubious strategy to extend and pretend, silver will likely resume its march higher. Enjoy the dunderheaded Fed action but don’t get complacent. My favorite show is back on television. Swamp People is on the History channel and it documents a few of the good people that live and hunt alligators in the Louisiana swamps. For one month in the year, they legally hunt alligators. They set traps for the gators and everything they catch, they take to market. I like the show because it is capitalism at work. The good folks that hunt alligators aren’t educated in some brain numbing Ivy League school. They are just good people trying to survive in the morass of government regulation. Yes, even alligator hunting is regulated by the freakin’ US government. I’ve got a feeling that unless something dramatic changes real soon, even passing gas in public will be regulated by the US government! We will soon all be required to carry on our person a container and suction instrument to capture the noxious gas to be disposed in Yucca Mountain. Failure to do so will result in a fine. At the end of the year, a 1099-G (‘G’ for gas) will need to be filed with proper tax forms giving the person responsible for the emission an extra tax penalty for fouling the air. We now live under the tyranny that our founding fathers like Thomas Jefferson warned us should we give government too much control. The gator hunters risk their own money and their own life. Yet our government feels compelled to regulate their lives and livelihood. Since the government controls everything now, the stock market also falls under their mantra. No, I’m not talking about the stooge that sleeps in the White House. I’m talking about the real power welded from the central bank - the Federal Reserve. They can get any egotistical narcissistic dingbat to portray the role of ‘President’. They can let him fly around on Air Force One and give him/ her the ‘royal treatment’. But the individual would have to be really stupid to think they had any real power. No, the real power is the Fed. Look how they manipulate the world every single hour of any single. day. Let’s take a look at the stock market. We would all like to think we are so smart and have such investment savvy that we can make money investing in the stock market. Sure. Well in today’s market, everything moves as one. I want to look at the chart below first. Take a look at ‘Chart 1’. We can see two lines. The gold line is the Dow Jones Industrial Average and I’ll bet that readers won’t guess what the blue/red line represents. Go ahead - take a look. 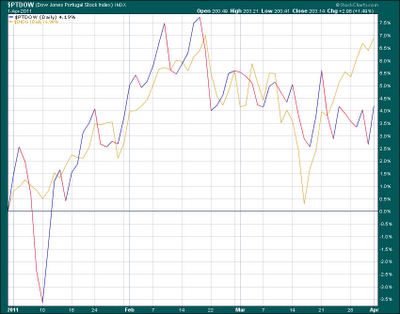 The term of the chart is year-to-date 2011 and we can see that both lines are positive for the year. Isn’t everything? This is exactly my point. The blue/red line is the Dow Jones Portugal Index. Yes, we are looking at the Portugal that is staggering toward the central bank apple wrapped in bailout tissue and it is offered by the serpent. Portugal will accept just like Eve once did. They are broke. They have debt that they cannot repay. They will not be allowed to default because they use the currency that central banks issue. The bailout will not be an option. As I wrote several months ago, there was no question that Portugal would have to be bailed out. How did I know? Because the government of Portugal swore they were in fine shape and unequivocally did not need a bailout. Governments are all liars. The austerity that will be imposed will crush their debt-riddled economy for years to come. So what? Is an economy really necessary to support a stock market? I think not. Bernanke thinks not as well. 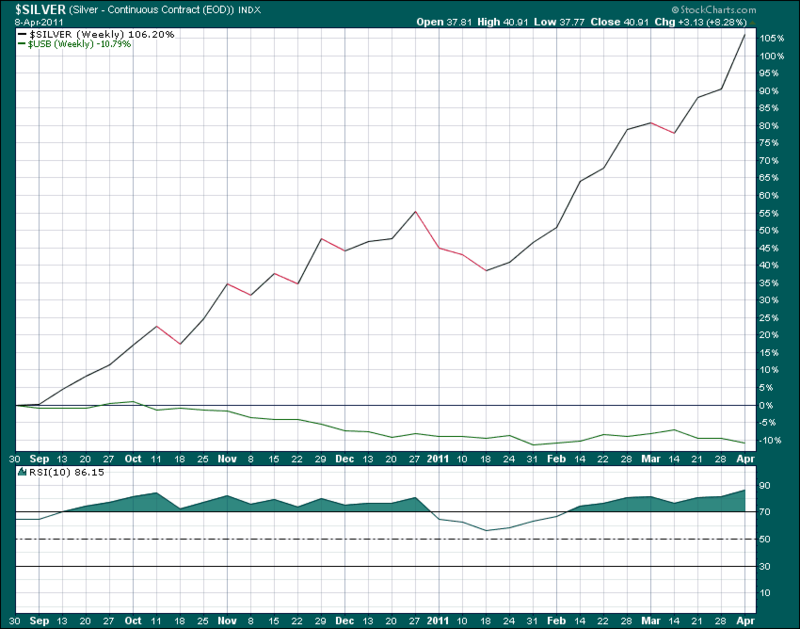 The Portugal stock index is rising. Aren’t they all? Take a look at the chart. Stocks to central bankers are like gators to Swamp People. They are all the same. Even broke countries like the US and Portugal go up when central banks provide the monetary firepower. Don’t get too cocky if your portfolio is doing well. Intelligence and skill are meaningless in this market. As long as the Fed and the interventionist central bankers keep the keg full, investors will keep drinking. Sadly, no one thinks about the inevitable hangover. Do we keep investing or do we go to sobriety meetings? I think we all know that the party is too tempting for investors to turn away. At least for now, the rally is still alive. Which stocks should we buy? Well, which gators do the Swamp People catch? Every one they see, right? 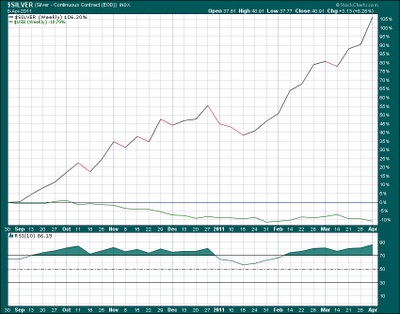 We will all need to adjust as the Fed’s QE2 comes to an end in June. At that point, we will have to wait for the next Fed stimulus to spur another rally mode. If they don’t, we will all riot!